I-Mockery.com - How To Use The Three Seashells! The Three Seashells Project! Demolition Man! How To Use The Three Seashells! Ever since I saw the movie "Demolition Man", I've felt like there was something missing from my life. No, not glow rods... though you've gotta admit, that'd be a GREAT item to have at parties. Who wouldn't want to use a stun baton on their friends for some hearty laughs? Also, I've always wanted to have a car with "security foam" in it should I ever get in an accident. I think the only reason they haven't made that stuff a reality yet is because people would crash their cars on purpose just to experience the joys of security foam. 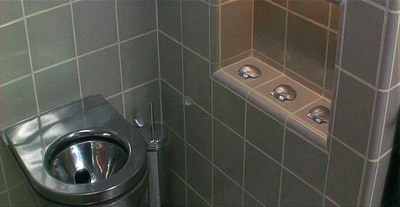 Still, putting the glow rods, security foam and even fancy Taco Bells aside, there was one unanswered question from Demolition Man that has continued to haunt me for years: The mystery of the Three Seashells. For the uninformed, Demolition Man takes place in the future and, in addition to the aforementioned technological advancements, toilet paper has become a thing of the past. Instead, people in the future use three seashells. Don't feel bad if this confuses you, Stallone never figured out how to use them in the movie either. Thankfully, in a recent interview, Stallone says one of the writers explained to him the general gist of how one was supposed to use the three seashells when taking a dump. With this newfound knowledge, myself and PoX have created this handy illustrated instructional guide which clearly explains how to use the three seashells. Yes indeed, all of your questions are finally about to be answered! Click here to download your printable guide! Just imagine how relieved your fellow citizens will be when they see these detailed instructions hanging in their stall! If you really want to go the extra mile, we also suggest removing all toilet paper rolls from the stalls and replacing them with three seashells of your choice. Citizens, together we can make the world a better place to live! Let's start with public restrooms! Important note: If you hang any of our guides in a public restroom, please take photos of it and email them to us so we can put them up on this page for all of your fellow citizens to see. Be well! Have any questions or comments about this piece? Ten Things That Make "Cobra" One Of The Most Underrated Macho Badass Action Movies Of All Time!